Latest News | Mindfulness Practice Community of Toronto | This is the website for the Mindfulness Practice Community of Toronto, a group of practitioners in the Plum Village tradition following the teachings of Thich Nhat Hanh. We invite you to learn how to choose and prepare food that supports your commitment to a compassionate world. This way of eating cares well for the planet, for our animal brothers and sisters, and for our health. Jackfruit Fensenjan: Fesenjan is a Persian pomegranate and walnut stew that is traditionally made with chicken. This version is an instant crowd pleaser and uses young jackfruit to create a stew that is just as hearty and satisfying as the original. Veggie Stir-Fry with Peanut Sauce: Vegetable stir fries are one of the simplest and quickest meals you can prepare. This recipe features an Asian-inspired peanut sauce that you can make gluten free, and you can use a variety of vegetables. 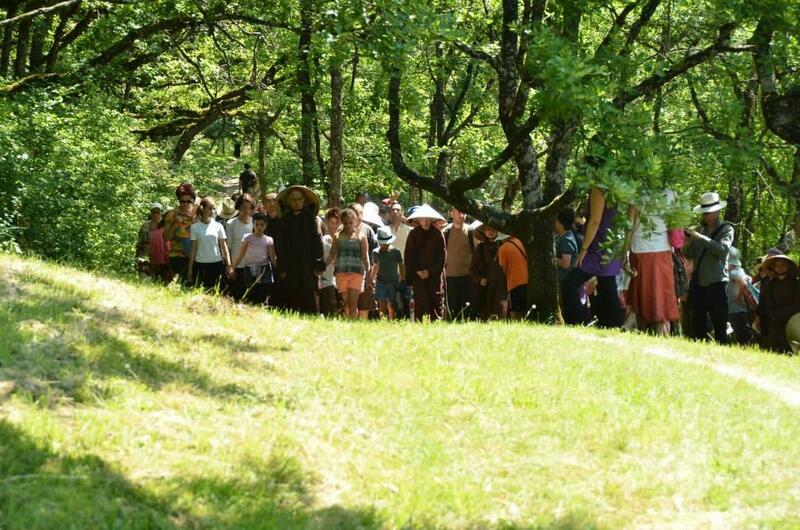 The Earth Holder Sangha is an affinity group within the Plum Village community with the aspiration to apply Thay’s teachings to protect Mother Earth. Anyone who is inspired can join. We hope you enjoy this beautiful teaching by Nomi Green, co-founding member of the Earth Holder Sangha. Located at Camp Samac, 275 Conlin Road East, Oshawa, Ontario, Canada. From Friday, May 4th, 2018, at 5 pm to Sunday, May 6th, 2018 at 4 pm. You are invited to join us for the retreat at Camp Samac in Oshawa, Ontario on May 4 – 6, 2018. The retreat will be led by monastics from Blue Cliff Monastery in the Plum Village tradition of Thich Nhat Hanh. During this retreat we will enjoy being alive in the present moment through mindful practices of breathing, sitting, walking and eating. We will come together as a community in peaceful solidarity with our monastic brothers and sisters guiding us in mindful living. There will be a kids program for children aged 5 – 12 and a program for teens and young adults. There will be no program or child care for children aged 4 and under. Sitting meditation cushions will be provided, but you are encouraged to bring your own. Accommodations will be simple bunk style dormitories with shared washrooms. Healthy, vegetarian meals will be provided. For more information about Camp Samac, please visit the website: http://wpc.scouts.ca/ca/samac-maps-and-directions. We look forward to your presence at Camp Samac. Please bring your own tent and camping equipment. Note: We invite those attending the retreat for two days to join us on Friday evening from 5-7 pm for a restful start to the retreat. Please note that no meals will be served on Friday evening. Please note that registration for this event closes 7 days before the event – the last day to register is April 27th, 2018. On December 17, 2016, MPC had their Christmas party celebrating with a potluck lunch, readings, singing and games. A good time was had by all!